Oxford University Press, USA, 9780195156966, 190pp. Jennifer Roberts and Tracy Barrett bring together their respective mastery of scholarship and storytelling to tell the history of a place, a people, and a culture that has left some of the most beautiful art, the greatest stories, and the most magnificent cities and buildings that the world has ever known. The Ancient Greek World uses primary sources such as Homer's Odyssey, Herodotus' Histories, a Minoan drinking cup, and a child's grave epitaph to present a balanced and lively narrative history of ancient Greece. A chronology, cast of characters, maps, pronunciation table, further reading, and index supplement the main text. 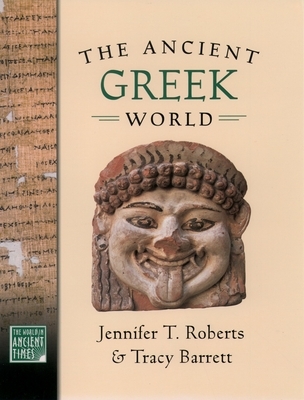 Jennifer Roberts is Professor of Classics and History at the City College of New York and the City University of New York Graduate Center. Tracy Barrett is the author of numerous books for young readers, including the award-winning Anna of Byzantium (Laureleaf, 2000) and Cold in Summer (Henry Holt, 2003). She teaches courses on writing for children and on children's literature and is on the faculty of Vanderbilt University in Nashville, Tennessee.